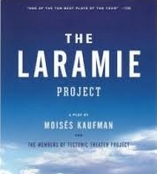 Out on Film in association with The Robert Mello Studio will present Moisés Kaufman and Members of the Tectonic Theatre Company’s THE LARAMIE PROJECT as a one-night benefit for The Matthew Shepard Foundation on Sunday, September 30, 2018 at 7:00 PM. The event is part of Out on Film, the Atlanta LGBT Film Festival, running September 27, 2018 until October 7, 2018. October 12, 2018 will mark the 20th anniversary since the death of Matthew Shepard in Laramie, Wyoming.